Revolutionary! A leather conditioner and vinyl protectant in one bottle! BLACKFIRE Interior Protectant with Polycharger is the only product you need to maintain the look and feel of leather and soft vinyl upholstery. This 100% water based protectant uses micro-engineered polymers that are readily accepted by leather and soft vinyl. 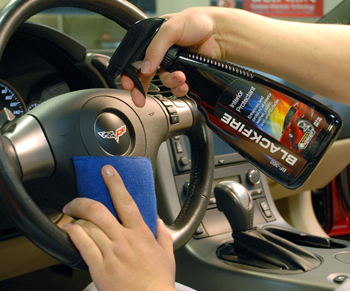 BLACKFIRE Interior Protectant contains no oils, silicones, or petroleum distillates. It leaves a deep, satin, natural-looking finish on interior auto surfaces. The perfect complement to BLACKFIRE's Interior Cleaner, BLACKFIRE Interior Protectant is a superiorr, technologically advanced vinyl and leather conditioner/protectant! Boosted with Polycharger, this formula provides superior protection and a like-new luster on interior surfaces. BLACKFIRE Interior Protectant preserves the softness and beauty of vinyl and leather. BLACKFIRE Interior Protectant is a 100% water-based formula containing no oils, no alcohols and no petroleum distillates. There is nothing to dry out leather or deteriorate stitching. BLACKFIRE Interior Protectant is perfectly pH-balanced (7) to match the pH requirements of leather. After treatment, a micro-fine moisture barrier remains on the surface to resist perspiration stains and help retard UV-induced fading. In the past, products marketed for both vinyl and leather contained either a petroleum solvent and/or oils to moisturize leather. These oils remained on the surface of vinyl creating a greasy finish and attracting dust. That won't happen with BLACKFIRE Interior Protectant. It dries quickly to a non-greasy, satin finish that does not attract dust! BLACKFIRE Interior Protectant is perfect for today's new interior materials. Many new automotive leathers are topped with a clear vinyl layer for protection. Owners can mistakenly treat these "leathers" with a leather conditioner which results in a greasy film because the oils are unable to penetrate the vinyl topping. BLACKFIRE Interior Protectant is perfect for both naturally faced and vinyl faced leathers. The satin finish will not create dash glare and complements the matte vinyl now used on most dashboards.